We have heard it said that Adventureland at Walt Disney World's Magic Kingdom is just a shortcut to get through the crowds on your way to Splash Mountain. It's just an older area of the Magic Kingdom that hasn't had a good overhaul in a long time with not much to offer. For others, it is the home of the two most popular Disney rides of all time: Pirates of the Caribbean and the Jungle Cruise. 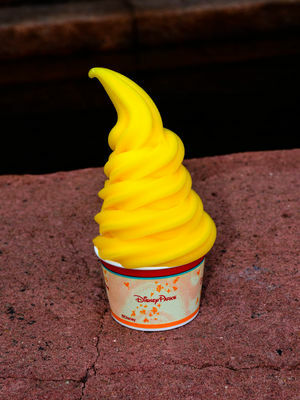 Plus, it's home of what's possibly the most popular dessert snack at Disney, the pineapple Dole Whip. This month, we wander through an old favorite as we explore Adventureland at Disney's Magic Kingdom. The entrance to Adventureland from the Central Plaza hub near Main Street gives a feeling of the South Pacific. Photo by Donald Fink. 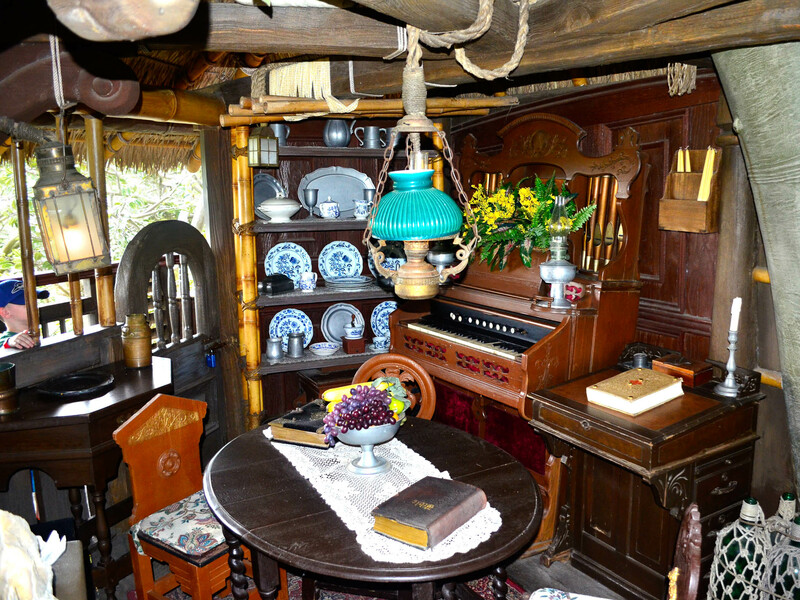 The Swiss Family Treehouse isn't actually a ride, but a walk-through depiction of the Swiss Family Robinson's treehouse. Photo by Donald Fink. 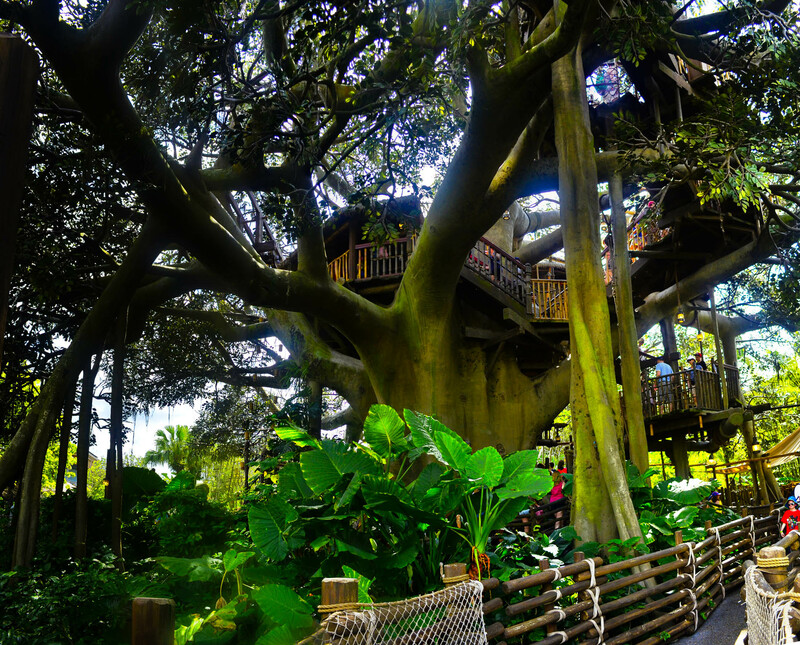 The Swiss Family Treehouse is an interpretation of the treehouse used in the 1960 Disney film, Swiss Family Robinson. The film, of course, was loosely based on the 1947 film of the same name, which was based on the novel written in 1812. 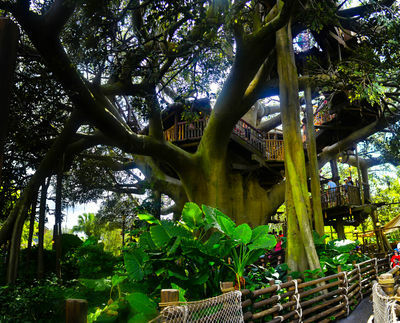 The Swiss Family Treehouse is at several Disney theme parks, but at Disneyland in California, it's been converted to Tarzan's treehouse. The Swiss Family Treehouse has several rooms depicting furnishings the stranded family salvaged from their wrecked ship. Photo by Donald Fink. Ground-level kitchen in the Swiss Family Treehouse. Photo by Donald Fink. The Magic Carpets of Aladdin. Photo by Donald Fink. The Magic Carpets of Aladdin is a "carousel" ride consisting of 16 separate carpets. In the front seat is a control that allows the riders to direct the carpet up or down. In the back seat is a control that controls the carpet's pitch. 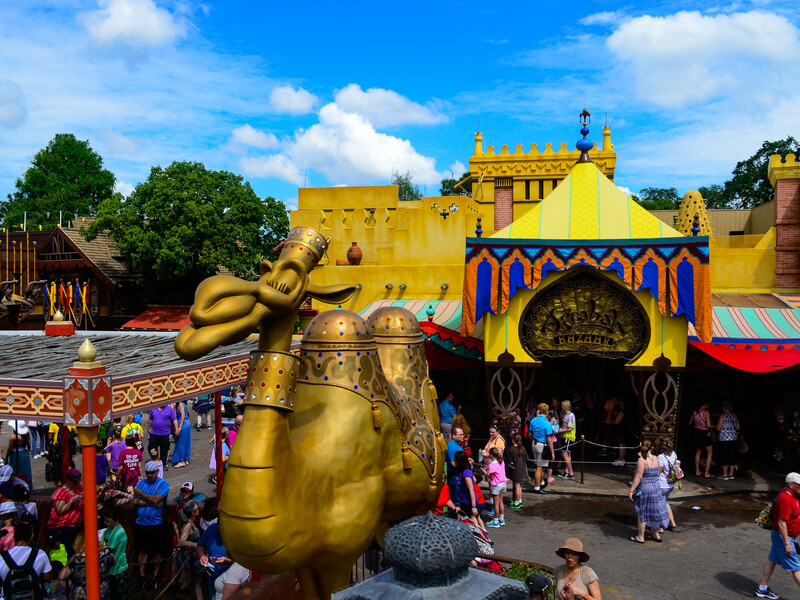 This ride is mostly uneventful and appropriate for younger children—but watch out for the spitting camel. 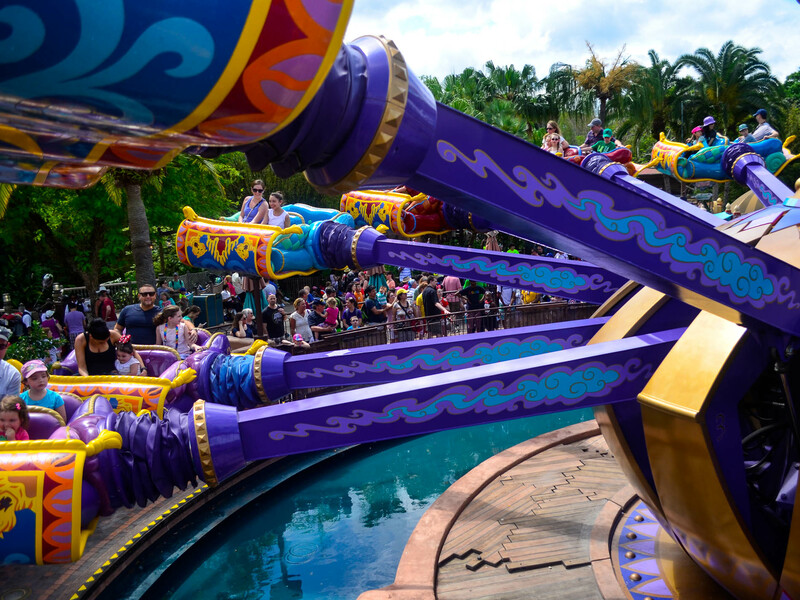 The views from the top of the Magic Carpets of Aladdin are great, but watch out for the camel. Photo by Donald Fink. 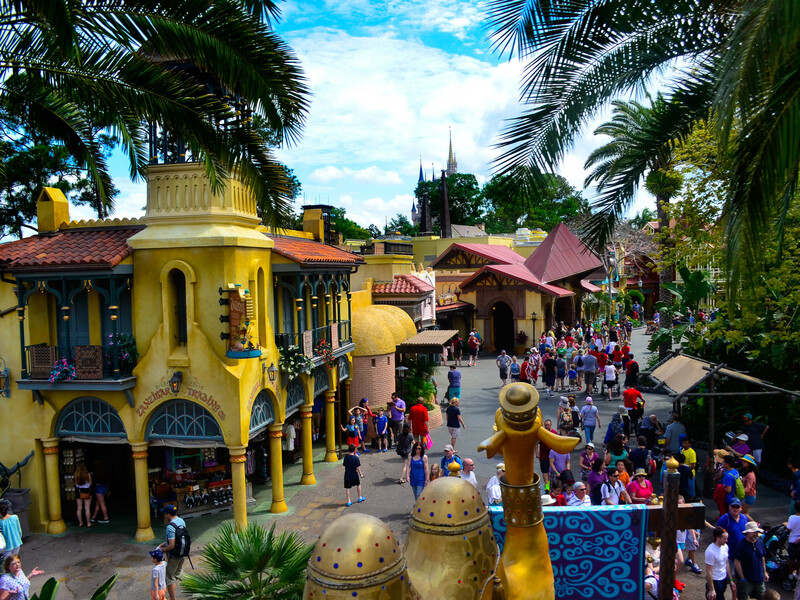 A view of Adventureland from high atop Aladdin's Magic Carpet Ride. Photo by Donald Fink. The Jungle Cruise originally opened in California in 1955, and has continued mostly without interruption. Photo by Bonnie Fink. 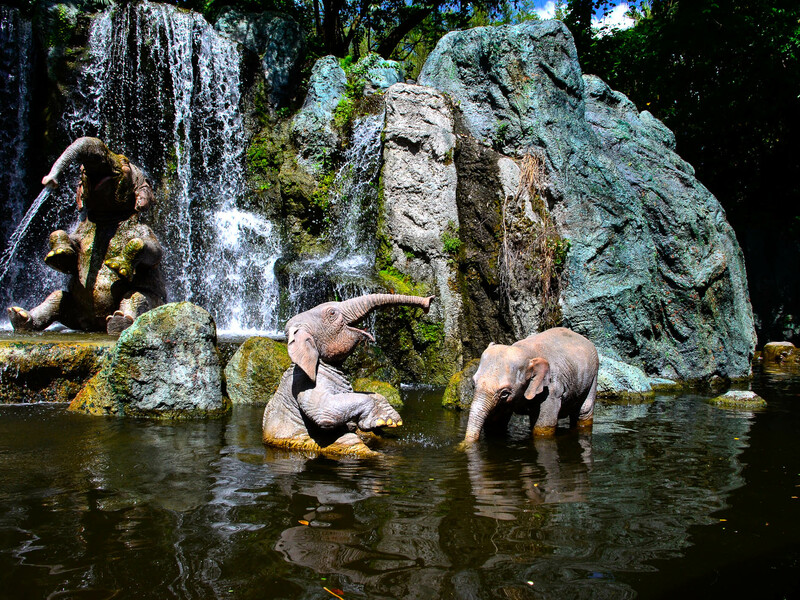 Elephants enjoy a splash in the waters of the Nile River along the Jungle Cruise Ride. Photo by Bonnie Fink. 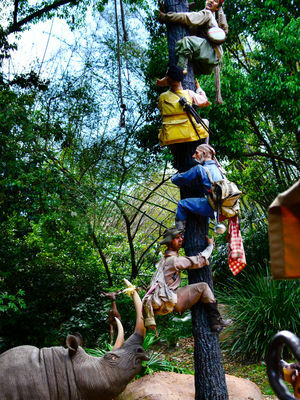 Amusing scene along the Jungle Cruise Ride, where an obviously angry rhino has tree'd the safari. Photo by Bonnie Fink. 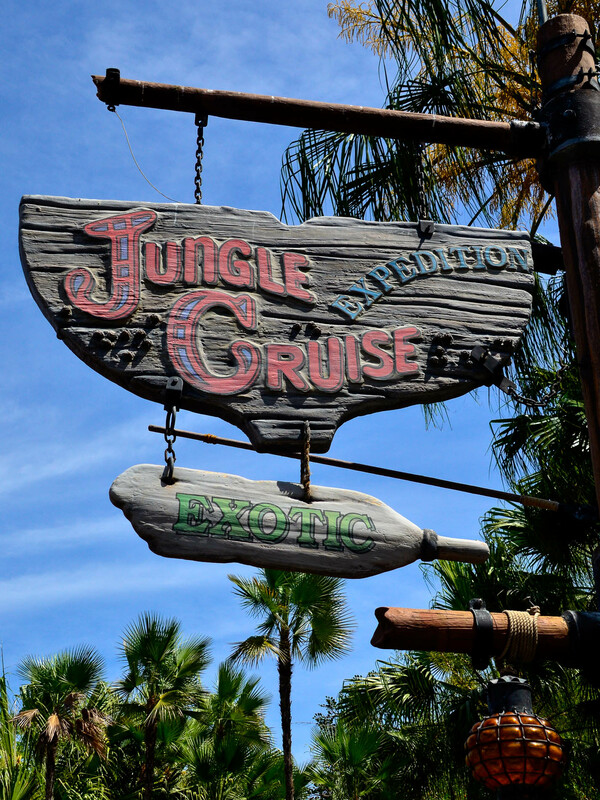 The Jungle Cruise Ride was at Disney when it opened in California. 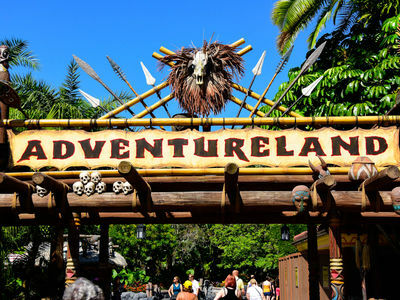 In fact, our information tells us that initially it was the only ride in Adventureland. 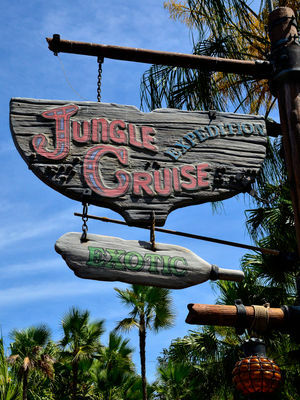 Today the Jungle Cruise Ride is present in some form at all Disney theme parks except Disneyland Paris, and continues to be extremely popular. The ride is said to have been inspired by the movie African Queen and a Disney True Life Adventure Film, The African Lion. There were no jokes in the original script with the dialog instead reading like a documentary. Jokes were introduced in 1962. 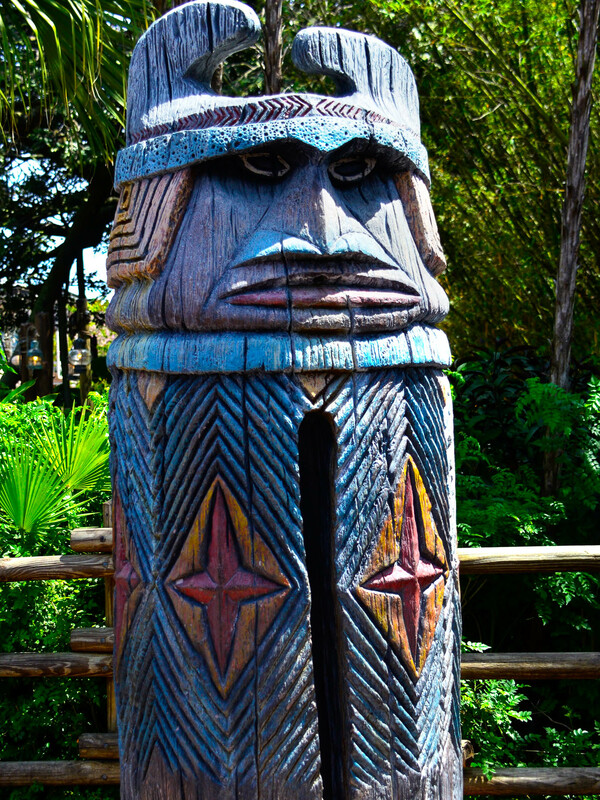 Tikis in Adventureland keep guests cool by squirting water. Photo by Bonnie Fink. As far as we can tell, the tikis located near the entrance to The Jungle Cruise ride are not named at Adventureland in the Magic Kingdom, but they're called Liki Tiki at Adventureland in Hong Kong. In both cases, they spray water on guests during hot weather, which can be welcomed—unless you're standing there trying to take a picture with an expensive Nikon. Probably the water on the concrete should have been a hint. 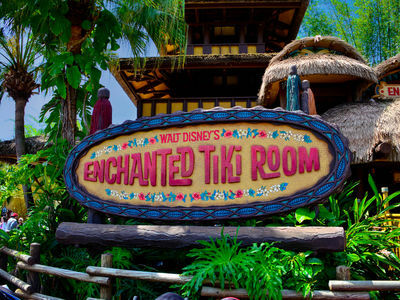 Walt Disney's Enchanted Tiki Room is a tropical serenade that kids will enjoy. Photo by Bonnie Fink. The Enchanted Tiki Room opened with Adventureland and the Magic Kingdom in 1971. It is similar to the show of the same name at Disneyland in California, featuring musical performances by audio animatronic tropical birds, tiki idols, and colorful flowers. In 1997 it closed for a year and re-opened "under new management", where some changes were made to the script and some of the animated performers. The Enchanted Tiki Room has had an active history. Some of it is discussed in this MousePlanet article from Jeff Kober. 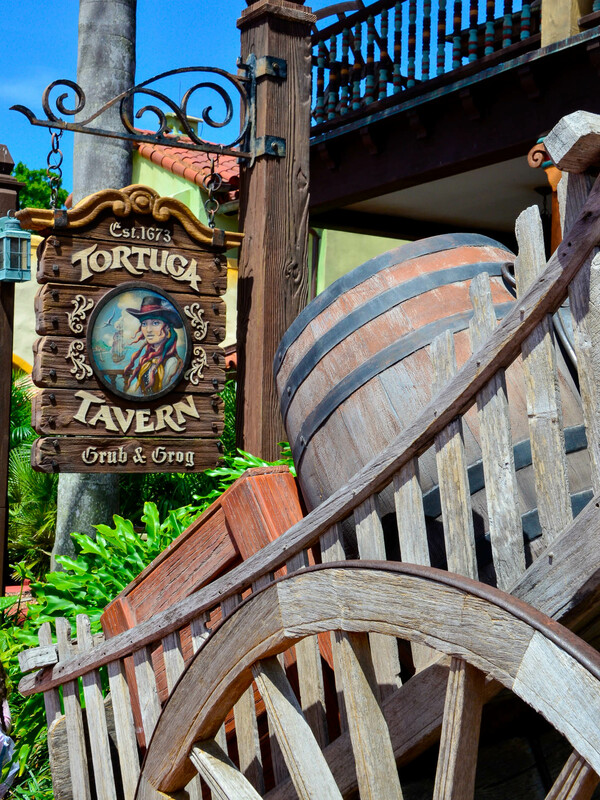 While you're exploring Adventureland, you can find nourishment at the Tortuga Tavern, a quick-service restaurant with Mexican cuisine. Photo by Bonnie Fink. 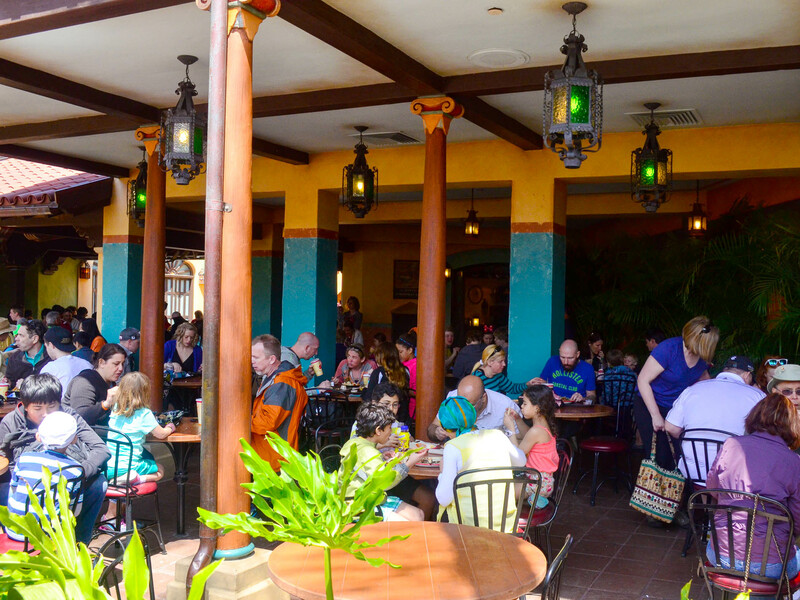 Seating is both covered and outside at the Tortuga Tavern. Photo by Donald Fink. When you're exploring Adventureland, you can grab a quick service meal at the Tortuga Tavern. This Mexican-style restaurant is family-oriented with a few surprises. When you order a taco salad, for example, you're given a flour tortilla bowl with seasoned beef. You then go to the topping bar and complete your salad with all the other amenities you like. Many of the meals served here are completed by the guest at the topping bar. Entrance to the ride, Pirates of the Caribbean. Photo by Bonnie Fink. 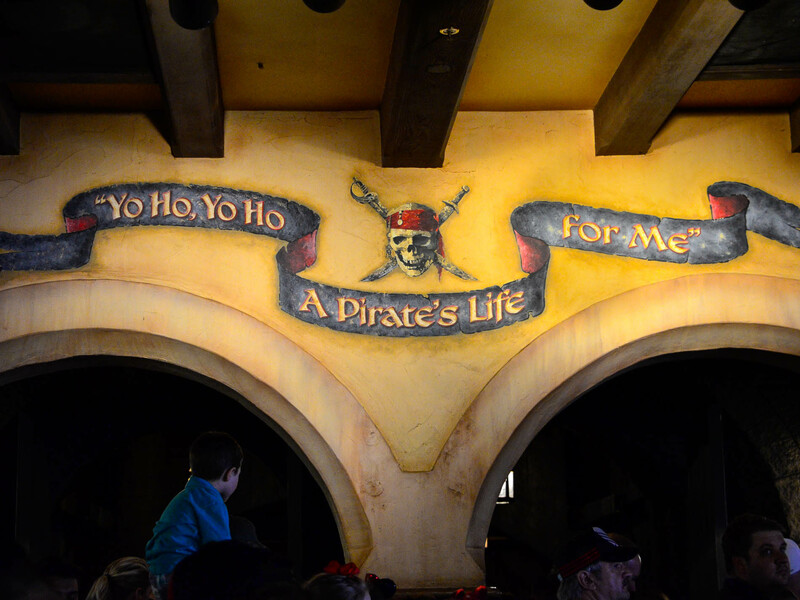 This phrase is posted at the entrance to Pirates of the Caribbean. 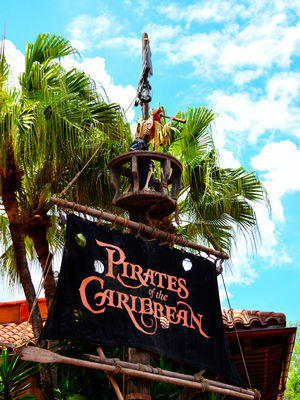 It is the theme song for the ride at the Magic Kingdom and Disneyland, and was used in the film "Pirates of the Caribbean: The Curse of the Black Pearl." Photo by Bonnie Fink. Pirates of the Caribbean originally opened at Disneyland in 1967. It was the last ride where the design and construction was personally supervised by Walt Disney. He died just three months before it opened. The original design was going to be a walking tour of wax figures, but Walt was so pleased with the reception of his "it's a small world" exhibit at the 1964 World's Fair that he decided to use boats. Pirates of the Caribbean opened at the Magic Kingdom in 1973. 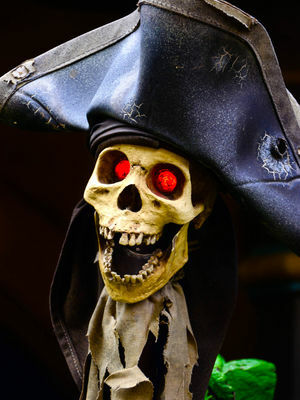 Since the success of the Pirates of the Caribbean films, Disney has been slowly incorporating characters from the movies into the rides, keeping them new and fresh. 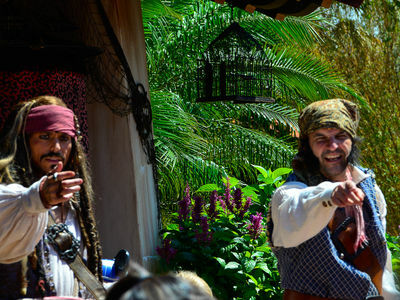 The Pirates of the Caribbean ride continues to be one of the most popular at the park. 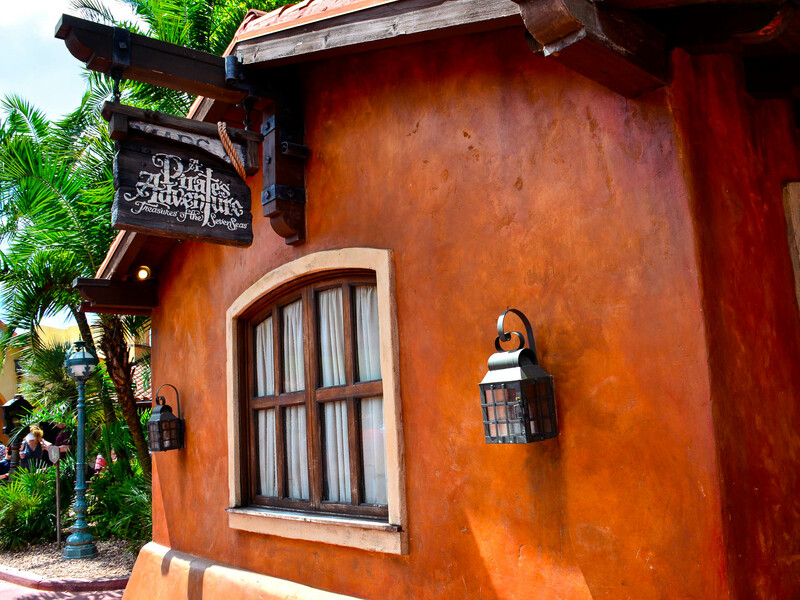 A cartographer's shop outside Adventureland near Golden Oak Outpost is where A Pirate's Adventure: Treasures of the Seven Seas begins. Photo by Bonnie Fink. 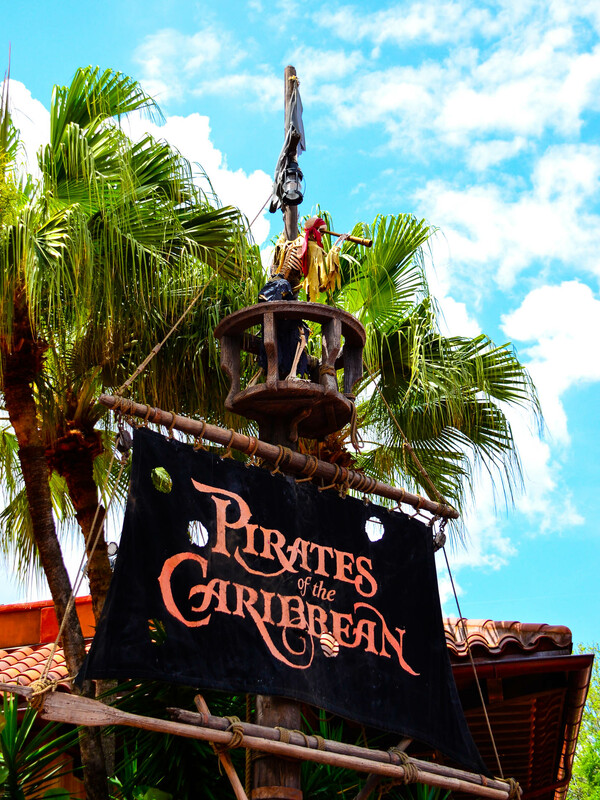 Just outside the gate to Adventureland, near Frontierland and Splash Mountain, there's a small building with a sign outside that reads, "A Pirate's Adventure. Treasures of the Seven Seas." In this cartographer's shop you'll find the beginning to a treasure hunt for children—or just about anyone for that matter—that takes you around Adventureland on a quest to find treasure. There are five different missions, each one having four or five stops. Each mission takes about 20 minutes to complete. As you make your way through a mission in A Pirate's Adventure: Treasures of the Seven Seas, you swipe your talisman—an RFID card—to get clues to your next stop. Here, pirate skulls animate with bright red eyes as they speak the clues. Photo by Bonnie Fink. Join Captain Jack Sparrow in "A Pirate's Tutorial," a stage show near Pirates of the Caribbean. The show performs nearly everyday, several times a day. Photo by Bonnie Fink. Pineapple Dole Whip cup at Adventureland, Magic Kingdom. This dessert is one of the most popular in the Magic Kingdom. Photo by Donald Fink. For some folks, the sun doesn't rise based on the availability of a pineapple Dole Whip cup at the Magic Kingdom. For others, it appears to be the reason they come to the park. There have been recent changes to exactly where you can get one of these little cups of pleasure, and it could cause panic for those who don't know. The pineapple Dole Whip—not to be confused with the Citrus Swirl—is still available at Aloha Isle. The Aloha Isle, however, has moved to the location of the Sunshine Terrace, which is behind Aladdin's Magic Carpet and next door to the Enchanted Tiki Room. The Sunshine Terrace moved to the previous location of Aloha Isle, and they still serve the Citrus Swirl. Clear enough? 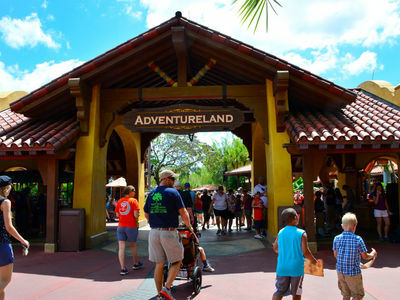 Entrance to Adventureland from Frontierland. Photo by Bonnie Fink. 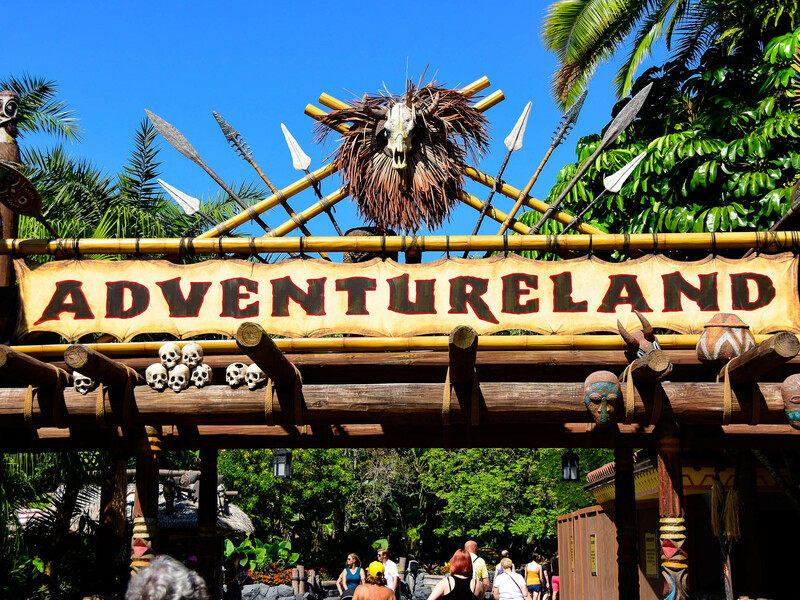 The next time you're at the Magic Kingdom, be sure to budget some time for Adventureland. If you've been treating it like a shortcut to somewhere else, we think you should give it another look. If you already know what it has to offer, then you know what we mean. 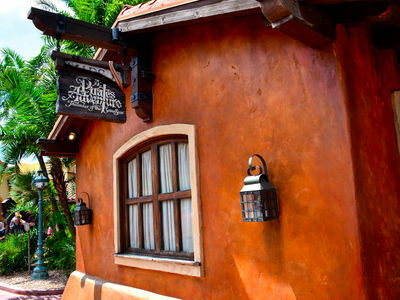 They've taken the salad bar out of Tortuga Tavern. I'm not sure if the taco salad is even on the menu any more, but I do know that the salad bar is no more. Also, you might want to mention that the Enchanted Tiki Room has returned to its original form - it is no longer Under New Management". I'm a little surprised. I've never heard of it being used as a short cut to Splash Mtn. The only short cut I'm aware of is taking the train from Main Street Station around to Splash Mtn. Or from Fantasyland using the wooden walkways around Rivers of America. That's a new one on me! I'm excited about the Veranda restaurant possibly opening back up. 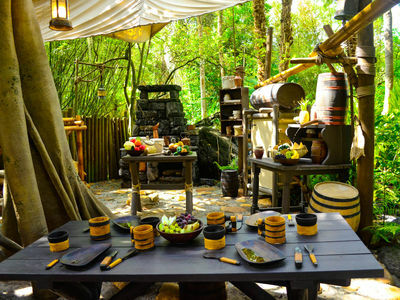 But what I really wish for is a Bengal BBQ just like the one in Disneyland's Adventureland. Yummy! I love Adventureland especially the Swiss Family Treehouse as that is one of my favorite Disney live action films. I am not a fan of the way the Magic Carpets was just sort of plunked in where it exists, To me it ruins the beauty of the original Adventureland bazaar area. I wish Adventureland could be expanded beyond Cariibbean Plaza but I don't know what's beyond there. After Tomorrowland, Adventureland is the area of the Magic Kingdom that needs some attention. I also am looking forward to the reopening of the Verandah. I hope the menu will be something a little more upscale and different like at Be Our Guest. Anything but the usual burgers, pizza and chicken tenders. I love Adventureland also, but it needs an update like Fantasyland.... and they made a good start by turning the Adventureland Veranda into a much needed table service restaurant. It's taking a space that it literally empty most of the year and making it something people are going to want to go to. I know I will. But IMO, the treehouse needs to go. No one even remembers that movie unless you are over 50. (like me lol) In it's place, and "E-Ticket" ride like Indiana Jones. There is room for it. The tree takes a lot of room and plus there is a lot of unused space between Jungle Cruise and the Crystal Palace, add in parts of that parking lot behind main street on that site, plenty of room for something spectacular. If the live-action upcoming Jungle Book ends up a hit, maybe they could replace the treehouse with an E-ticket adventure ride on the scale of Indiana Jones.